After a light snow event yesterday, we are headed into a warmer pattern for the next few days as winds turn to the southwest. Temps will rise above freezing today into the 30′s and will hit 40 in some spots Saturday and Sunday. Sunday night is when the forecast gets tricky. A storm system will be moving out of the Great Lakes in one part of the Jet Stream. Another storm system in the southern Jet Stream will be moving out of the Gulf of Mexico. If they can join together, or “phase”, than the storm would be a lot stronger. Right now, I think that they will not phase resulting in a weaker storm system. The other question in the forecast is about temperatures. For the 2 days before the storm, winds will be blowing from the southwest ushering in warm air. As a result, precipitation type becomes an issue. 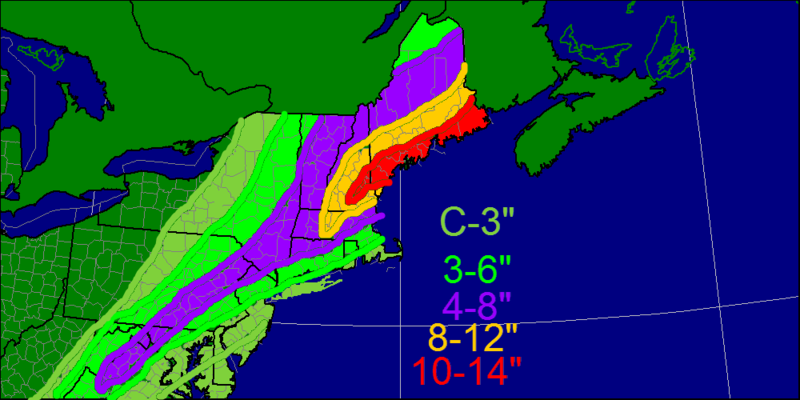 As of now, I expect a mostly snow event with the exceptions being in the Midcoast region and coastal York county. Amounts will be held down slightly there though the snow map reflects higher liquid amounts along the Midcoast rather than the mixing potential. After this system, strong NW winds will bring in very cold air from Canada with highs in the low teens and lows well below 0. There is another storm on the horizon in about a week however, it is too far out to discuss that in any detail. Today will feature an overrunning precipitation event with mainly light precip. 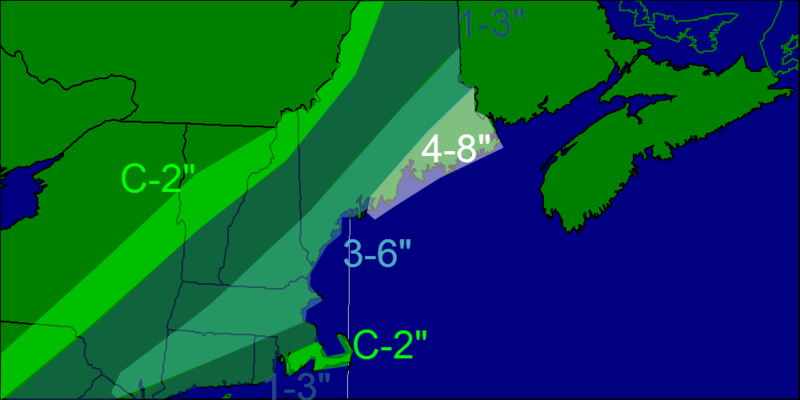 Rain will be the dominant precip type along the coast with snow inland. It will be mild out there in the 30's and 40's. With regards to the ice storm, it looks like the area most affected will be the foothills of Maine and the mountains of New Hampshire. Up to 3/4" of ice could fall in those areas. Heavy rain will be the big story across southern coastal Maine, southern New Hampshire and the rest of Southern New England. The mountains of Maine and far northern Maine, New Hampshire, and Vermont will see a mostly snow event from this which is good for the ski areas. Today, the warm air advection responsible for this weekends ice storm will kick in bringing temps above freezing for the 1st day in quite a while. Partly cloudy skies will dominate so enjoy the sun before it retreats behind the clouds for a while. Snow and sleet will move in Friday and change to freezing rain or maybe even rain along the coast. This precipitation will be light however, not significant enough to cause major issues though roads will be slippery. Saturday will feature cloudy skies with the chance for light freezing rain before the real event gets underway Sunday. It will start as snow for the interior and freezing rain for the coast before everyone changes over to freezing rain. 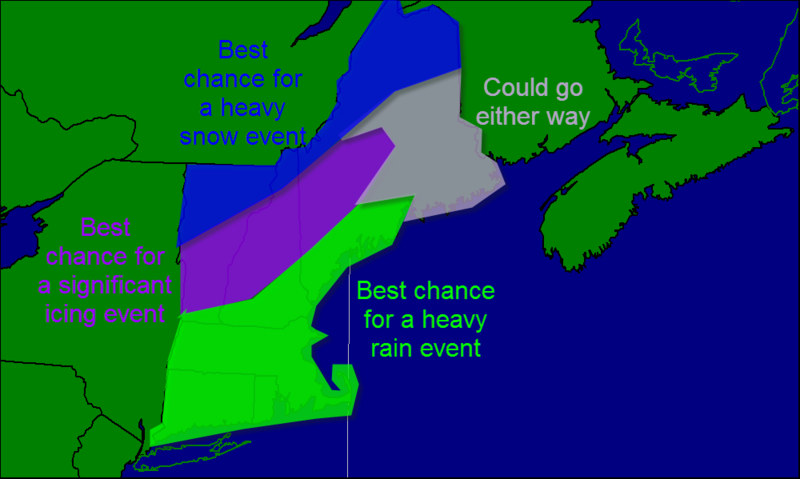 This will be heavy at times with moderate to heavy accumulations likely. This WILL NOT be anything like the ice storm of 1998. 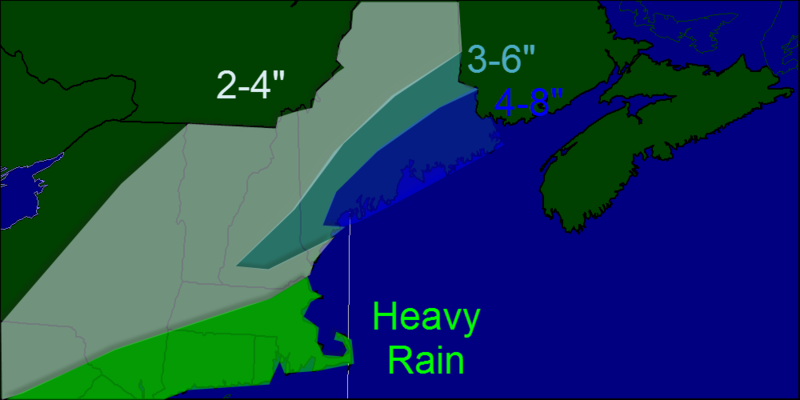 A potential comparison might be the 2008 storm though amounts will probably be less than even that. Snow is coming to an end across Midcoast and Downeast Maine this morning and will move out by midday. Temps will be slightly below average in the 20's and 30's. The other storm I'm watching very carefully is one that will impact the region on Saturday/Sunday with the potential for significant ice. Keep in mind that this storm is still a few days out however, all things look good for a freezing rain event. Today will feature frigid temps with reading well below zero in most areas. 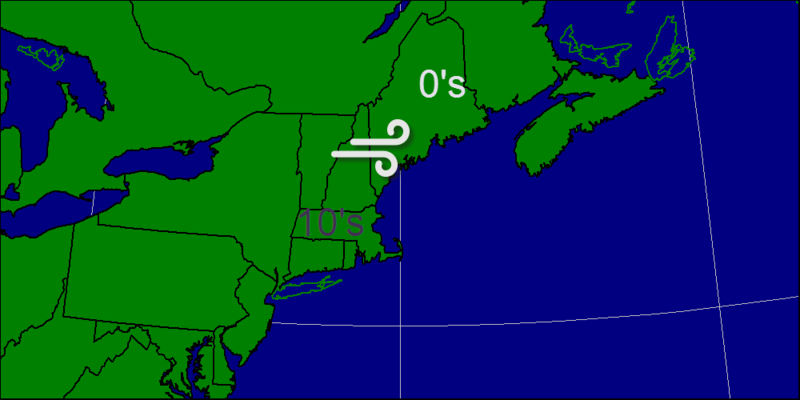 I expect temps to warm into the 10's and 20's for most of us and will struggle to get above 10 in northern Maine. The other story today will be the snow. Snow has already developed in southern New England and will spread northward today. I expect it to reach New Hampshire and Maine this afternoon into evening. Snow will taper off and end tonight after dropping several inches of snow on the coastal plain. After our storm yesterday, very cold air will be moving in. Temps today will struggle to get out of the teens in the south and the single digits in the north. Wind chills will be below zero region wide. Tomorrow we will see another round of accumulating snow, likely totaling 2-4" along the coast with a coating to 2" inland. Today will feature cool temps and the chance for a flurry as a weak area of low pressure passes to the north. 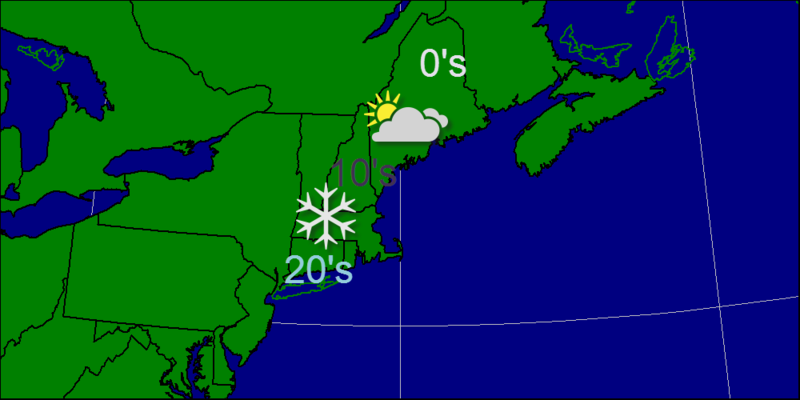 temps will be in the 10's and 20's across northern New England and the 30's across southern New England. 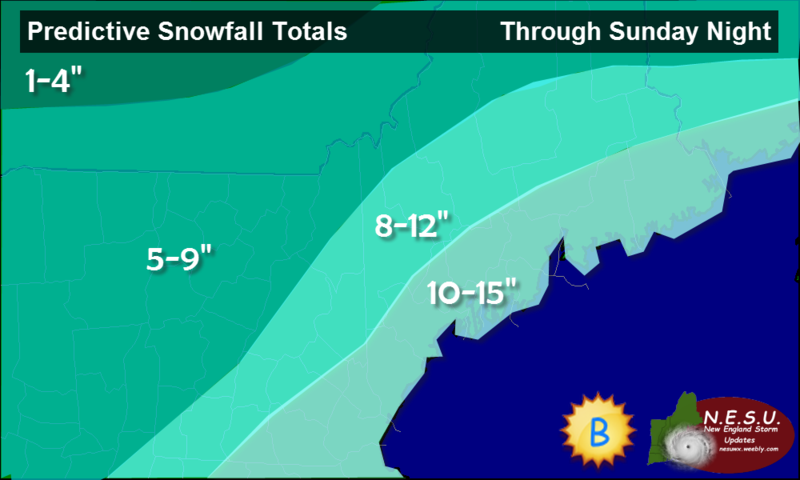 Above is my thinking on the snow accumulation for Sunday. I expect the bulls eye to be in southern coastal Maine where proximity to the low, high QPF, and high ratios will all align reasonably well to produce heavy snow. I will have another update tonight or tomorrow morning. Last night an arctic cold front moved through with some snow which may have accumulated to an inch or so, but more importantly, it brought some much colder air. Today will just be cold. No sugar coating on that one. 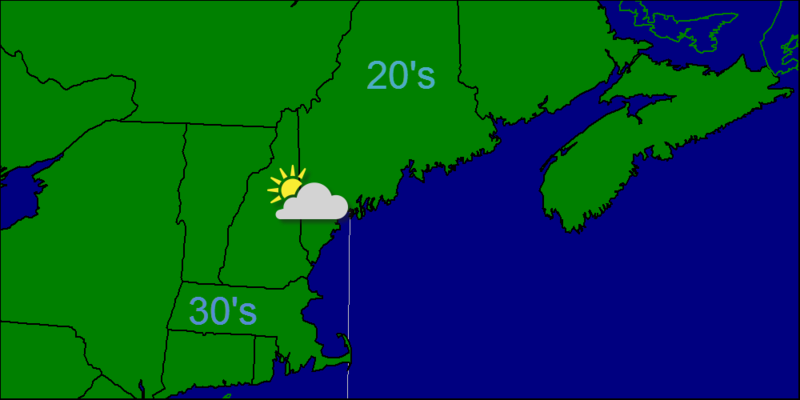 Temps will struggle to get above 25 or so anywhere in New England. I'm not looking for too much wind at the moment, but that could make things feel even colder. Regarding the potential nor'easter for Saturday into Sunday, it is looking less like a nor'easter, and more like a wave of low pressure passing off to our southeast. I may or may not have a snow map ready this afternoon but there is a good possibility that if the 12z models agree on one solution or another, confidence will be high enough for a snow map.